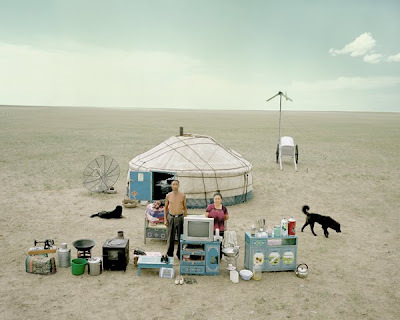 Family Stuff è il titolo di un progetto fotografico realizzato dai fotografi cinesi Huang Qingjun e Ma Hongjie sulle condizioni abitative nella Cina contemporanea: le immagini mostrano famiglie in posa fuori delle loro abitazioni, circondate dalle loro cose. Immagini molto belle e un'idea davvero interessante, ma pochissime tracce sul web (almeno io non sono riuscito a trovare di più, ma neanche il blog di Belen Cerezo dove ho scoperto il lavoro e che ringrazio!). 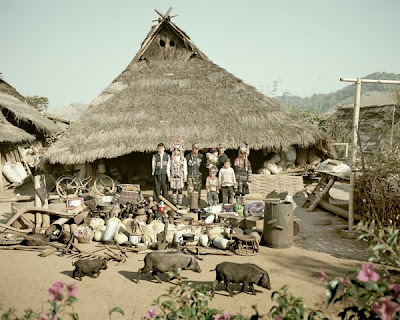 Family Stuff is the name of a photographic project by Chinese photographers Huang Qingjun and Ma Hongjie on the living conditions of people in contemporary China, showing families outside the place they live in surrounded by their, as the title say, stuff. Great images, great concept and sadly very few images and informations on the web (at least I was not able to find more, and neither was Belen Cerezo's blog, where I found out about this work - thanks for the tip!). Hello! I found this project very interesting! I am not sure about the authorship, as in Paris Photo it only appeared Huang Qingjun name. I visit your blog regularly, very good content!! Hi, thanks about the blog - on the 798 website the two photographers are credited with the same work called "Family Stuff", and each of them has a gallery with sample from the project, so all the clues bring up to a coauthorship of the two! Thank you!! I will write this in my blog! It makes sense that both photographers are the authors of this project. I remember a similar project, with family houses from many different countries and nations. Unfortunately I can't remember the author of the project. I think I saw it on an italian magazine (Internazionale) one year ago, or even more. Do you know something about? thank you both for your respective blogs! Very good place for my eyes and my mind.